As we age, being over weight can be a problem for some seniors. With the right advice from personal trainers in the UAE weight loss is possible at any age. Weight loss for seniors can be achieved through good diet and nutrition and some form of exercise. Exercise for seniors doesn’t need to be difficult, time consuming or stressful on the body but with any diet plan you should also seek the advice of a professional. As we age we inevitably become less active. Regular fitness exercises do help but many seniors in the UAE who get little active exercise on a daily basis tend to suffer with weight problems – do you think this is a direct result of being less active? In my option as a personal trainer in Dubai weight problems for seniors are not only a result of being less active, there are some other factors as well. Your metabolism lowers with age, that means you can not eat as much as you could when you were 20 years old. Another thing is your nutrition. Nutrition plays a big part when it comes to weight problems. You have to control your portions sizes and eat whole food instead of processed food to help maintain a healthier weight and fitter lifestyle in senior years. It can take more time to lose weight if you are over-weight and older. Can you provide some examples of gentle exercises that are designed to help with weight loss for older people? Power/Fast walking does have a lot of health benefits. You can either do it on a treadmill, inside or outside. Going for a regular walk is one of the best and easiest things to do for your health and for weight loss as well as it keeps you active as you get older. Another way to lose weight can be on the indoor exercise cycle. Cycling is a very good option especially if you have knee pain/problems because the pressure places on the knees is minimal and the risk of getting an injury is very small. So you can either powerwalk or cycle everyday for around 20-30 minutes – something most seniors in the UAE should be able to achieve. As a professional personal trainer in Dubai what advice would you give relating to ‘diet’ when it comes to seniors who are trying to lose weight? First of all make sure you eat whole food instead of processed food. Our body understands the chemistry of real food and utilizes it much better. However, when you add processed foods into the mix, you usually are adding more sugar, sodium, chemicals, and refined carbohydrates. Number 2, you have to make sure you get breakfast, lunch and dinner everyday and I would also advise to get some small snack between meals, it could be veggie sticks (carrots, celery, peppers etc) with a bit of hummus. Number 3; make sure you get protein to your 3 main meals. Protein will keep you full for longer while improving your satiety. 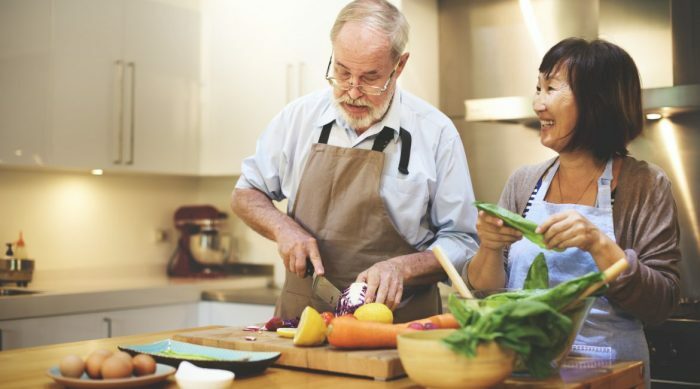 For seniors who cannot exercise too much due to pre-existing medical conditions that are related to age what nutrition advice can you provide – are there any examples of what to eat and what to try and avoid? One small step if we want to lose weight should be; don’t drink your calories! Carbonated beverages and juices are often loaded with sugar. Those “empty” calories can add up quickly, without giving you the satisfaction of being full. Here is an example of what you can have for breakfast; it could be eggs or low fat yogurt with some berries. Eggs and yogurt are both high in protein and it will be digested at a slower rate than simple carbs. For lunch or dinner you can have some kind of protein, you can choose by yourself, it could be chicken, meat, poultry or salmon. And you can cook some different kind of vegetables and have a small portion of rice, potatoes, pasta or sweet potatoes. Josefine is a female personal trainer based in Dubai who can provide personal fitness services to any age group including seniors in Dubai and children. You can view Josefine’s full UAE personal trainer profile by clicking the link below.